Each year the International Standards Organisation releases the results their research on take-up of ISO standards across the world. This year follows past upwards trends. 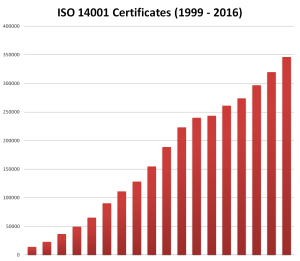 As usual the Quality standard ISO 9001 dominates the scene with over 1 million certificates in 2016 (current certificates, not just issued that year) – 1,106,356 up by 7%. ISO 14001, the standard for environmental management, is the second most widely used with 346,189 certificates worldwide. This saw an 8% increase over the last year. China has the most ISO 14001 certificates by far with 137,230, with Japan & Italy following with 27,372 and 26,655 respectively. This year the United Kingdom is down slightly (6%) & slipped one place in the league table to fourth, with 16,761 certificates. It could be that this slight decrease is due to companies not knowing how to implement the latest version of the standard, ISO 14001:2015. Talking to certification bodies, they’ve told me that companies are worried about how to tackle the new standard’s requirements. It is feared that these companies will fall through the cracks, losing their ISO certification & risk poor feedback from their customers. With the increasing political & economic uncertainty facing us nowadays, I think standards will become even more important. Suppliers need to prove their trust – standards show that you are doing things correctly & according to your customers’ needs. Make it easier for customers to buy from you. ISO 50001 the Energy Management System standard has seen a staggering 69% increase, rising to 20,216 certificates worldwide & 2,829 in the UK. 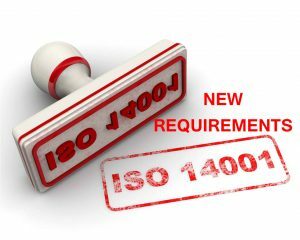 As one route to compliance under ESOS, I think ISO 50001 will become more popular, particularly as it slots nicely in with ISO 14001. Only 11% of UK certificates were for the new ISO 14001:2015 standard (although this is higher than the 7% worldwide) – clearly showing that companies are slow on the uptake. With the September 2018 deadline looming, it is important that organisations make the transition now or risk losing their certification. If you too are concerned about transitioning your existing EMS to the new standard, I can help you. It can be a daunting task if you don’t know exactly what’s needed. I have worked with clients large & small, taking them through the whole process smoothly & successfully. Get in touch to see how I can help.